Visit the city of architectural wonders on the bank of river Yamuna thathas always inspired poets and lovers throughout the world !! The city of Agra is truly a tourist's delight when it comes to historical monuments, extraordinary Mughal architecture, sweets and shopping. The royal capital of the erstwhile Mughal Empire, Agra is filled with magnificent grandeur. The city is synonymous with the grand Taj Mahal, one of the most beautiful monuments in the world. It is a legendary architecture of pure white marble, a tribute by the Mughal Emperor Shah Jahan to his wife Mumtaz Mahal, and an inspiration for all the lovers in the world. But Agra is not only about the Taj Mahal. The charm of Agra Fort, Jama Masjid and Sikandra also draws millions of tourists to Agra. Built over a period of 22 years (1631 - 1653) at an estimated amou nt 35 million rupees, the Taj Mahal is listed among the seven wonders of the world. Ustad Isa Khan, the chief architect, supervised the construction of this amazing monument, employing about 20,000 artisans and workers, under the orders of the Mughal emperor Shah Jahan. Inside this beautiful monument lie the crypts of Shah Jahan and Mumtaz Mahal, side by side with their heads facing in the direction of the holy city of Mecca. The Taj and the crypts are intricately decorated with carvings, inscriptions, jali work etc., which, at one point of time, were studded with semi-precious stones and gems. It was built by Shah Jahan in memory of his loving wife Mumtaz Mahal, whose unparalleled beauty was the inspiration behind its construction. Listed as one of the World Heritage Sites by UNESCO, Agra Fort is a marvellous set of monuments. Widely known as the Red Fort of Agra or Fort Rouge because of the generous use of red sandstone, the monument displays stun ning and royal Mughal architecture. 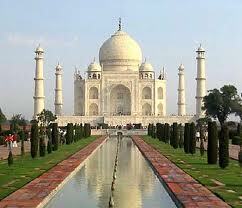 The Taj Mahal is located about two km from the Agra Fort on the banks of River Yamuna. Founded as a military establishment by Akbar in 1565, the fort is a grand and tall architectural structure belonging to the typical Mughal style. It was completed in the year 1571. Built over an area of 2.5 km, the fort has two main gates- the Delhi Gate and the Amar Singh Gate. Entry is permitted only through the Amar Singh Gate. 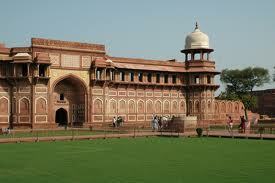 Visit the peaceful resting place of Akbar to have a glimpse of the royal, lively and memorable life of Akbar the Great. 10 km north of Agra lies the city of Sikandra, which is popular for the Sikandra Tomb. This tomb of the great Mughal Emperor Akbar was constructed by the Emperor himself. It is known for its unique architectuiral style, which is supposed to be influenced by Hindu, Christian, Islamic, Buddhist and Jain pa tterns. After the death of Akbar, the construction was completed by his son Jehangir in 1613. 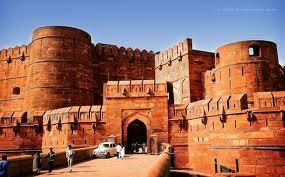 It got its name from the Afghan general Sikandar Lodhi who occupied Agra in the year 1492 A.D. The building is of five storeys, four of which are made of red stone and the fifth is built out of white marble. Built in the Indo-Saracenic architectural style, the 100 feet high monument has four minarets each containing a flight of 93 stairs. One can enter the monument through the Buland Darwaza, the towering main gate that opens on the southern side. Akbar's tomb is situated in the basement, close to the tomb of Mariam Zamani, Jehangir’ mother. The words - Allah-o-Akbar (God is Great) and the name of the deities of 99 religious sects is inscribedd on the walls of the tomb.